16,New Court road, Gyadi Gyadi,Kano. How Do I Obtain An Export License in Nigeria? 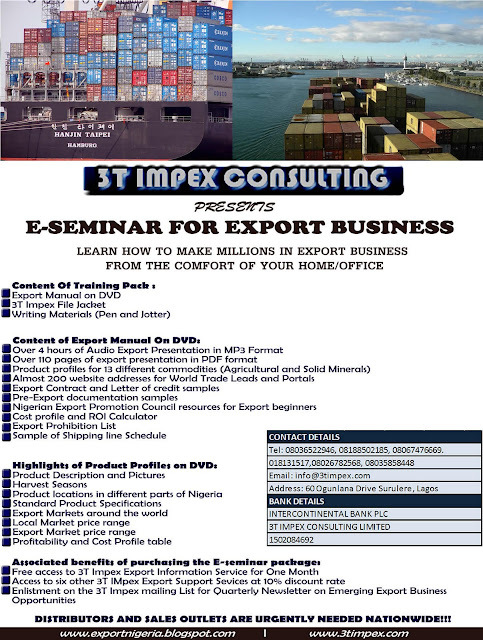 The Nigerian Export Promotion Council (NEPC) is the agency saddled with the responsibility of promoting the non-oil export and the issuance of the export licenses in Nigeria. 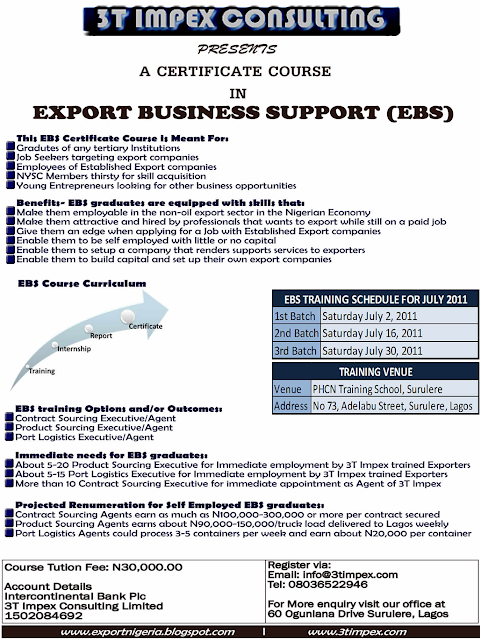 The license can be obtained within one week in any of the NEPC offices across the country. This license costs NGN10,000.00/ 2year. 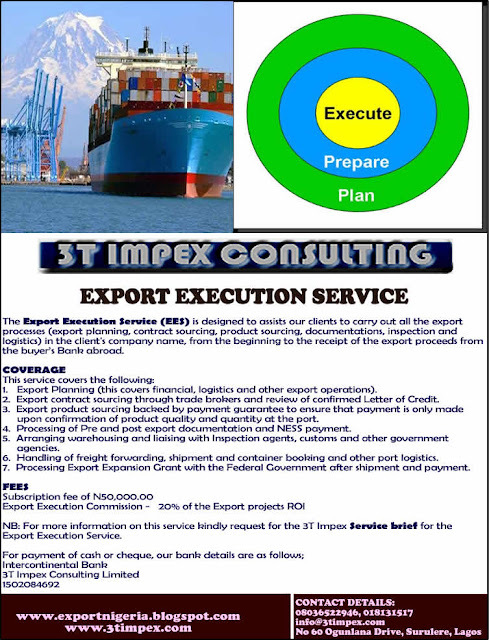 1.A duly completed export license application form obtained from the Nigerian Export Promotion Council. The original copy of the filled, signed and sealed form and copies of all the other documents will be submitted to the NEPC office. The Lagos office of NEPC is located at 13/15 Ladipo Oluwole Street, Liverpool Area Apapa, Lagos. It’s no more news that Nigerians are scattered all over the world and that out of every 4 blacks you see on the surface of the earth, one of them would likely be a Nigerian. This to me is a very big opportunity as far as the export business is concern but we are nowhere near tapping into these potentials as the Asians have done for over past 3 decades. The ever increasing population of Nigerians in different parts of the world (which are potential export market) is a great opportunity for the Nigerians at home to explore by simply working with other Nigerians abroad to develop the export markets. Apart from the facts that most Nigerians and other Africans in all these countries are hungry for African foods, clothing and other items of African Origin, these countries are highly industrialized and they therefore need most of the Nigerian commodities (both Solid Minerals and Agricultural commodities) as raw materials to be used in producing various items in their factories. 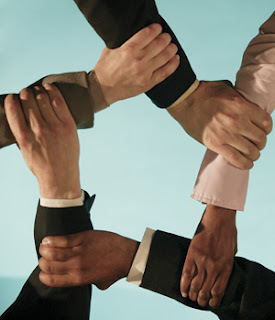 To the extent that trade synergy between Nigerians at home and abroad is of great benefit to both parties and our nation at large, it is also interesting to note that this trade synergy have weaknesses and threat which confronts the strength and opportunities respectively. The SWOT analysis below reveals the details of the Strength, Weaknesses, Opportunities and Threat of the proposed trade synergy between Nigerians at home and abroad. 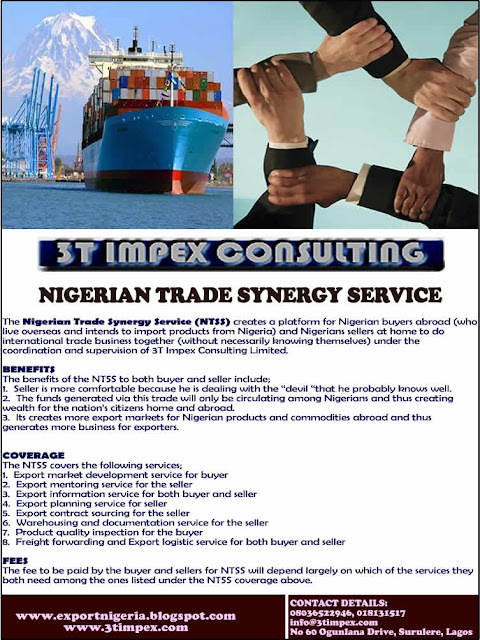 To tackle most of the issues (weaknesses and Threat) raised above and thereby reducing the inherent risks in this synergy and thus making the proposed international trade business synergy feasible between Nigerians at home and abroad, 3T Impex Consulting Limited have designed a service called the Nigerian Trade Synergy Service (NTSS). For more information on how the NTSS works, kindly check our next blog posting titled 3T Impex Service: Nigerian Trade Synergy Service (NTSS). Description:. Shea nuts are primarily grown in West and Central Africa in the semi-arid Sahel,referred to by traders as the "Shea Belt". Vitellaria paradoxa and Vitellaria nilotica are the two main varieties. Vitellaria paradoxa is exported in the largest volume and grows throughout the West African region.Vitellaria nilotica is produced primarily in northern Uganda and southern Sudan. Harvest: Shea nut trees grow widely and naturally in West Africa. They only begin to bear fruit after about 20 years and do not reach maturity for 45 years. They may continue to produce nuts for up to 200 years after reaching maturity. The nuts, which are embedded in a soft fruit, fall to the ground during the harvesting period (typically June through August). They are then buried in pits which cause the pulp to ferment and disintegrate and produce enough heat to prevent germination. The nuts are dried for a few days and are later shelled and winnowed, usually by hand. The kernels are dried further to reduce moisture content from about 40 percent to about 7 percent. Locations: Sheanut grows in the wild across the Sudan-Sahelian region of Africa. The major producing countries are: Nigeria, Togo, Benin, Ghana, Uganda, Mali, Burkina Faso and Central African Republic. Nigeria is currently the leading producer of Sheanut in the world and in 2004 Nigeria's production of the commodity was 414,000 metric tonnes with export value of US$61.04 million (Source: FAO). 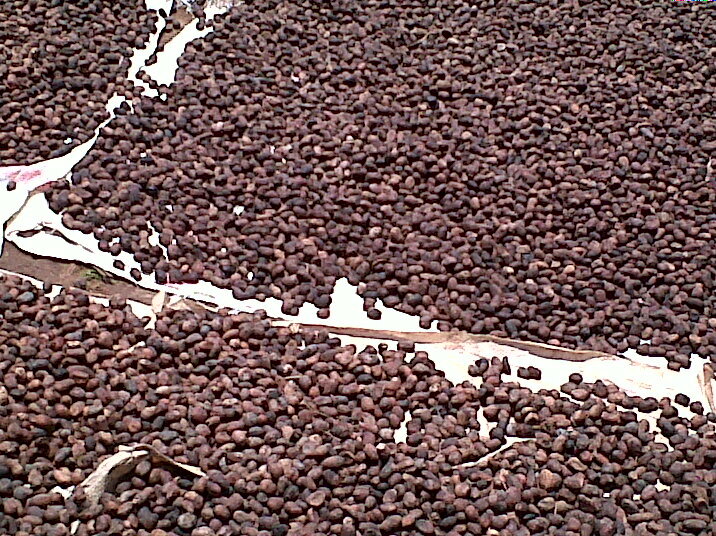 Shea nut is grown in Kwara, Kogi, Niger, Oyo and Ogun state. It can also be found in a number of the northern states of Nigeria. The oil content is the most crucial element of the shea nut as that component is an important ingredient in the composition of the butter that goes into Cocoa Butter Equivalents and other by-products. 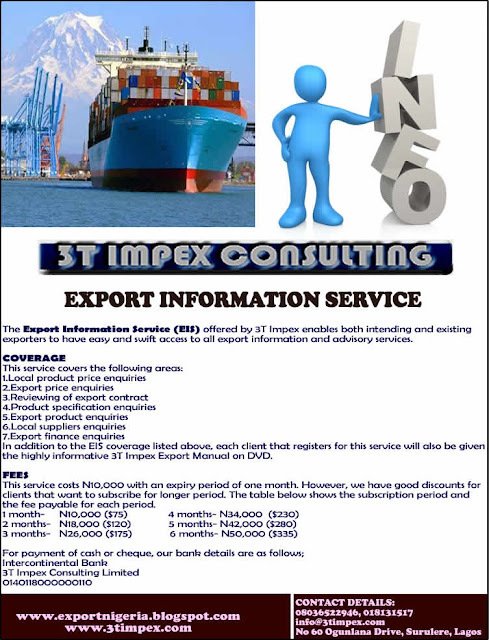 If the oil content is higher and the FFA and moisture content is lower, then the exporter will receive a price premium. Export market: A few companies based in Europe control the import market for shea nuts. Their main clients are chocolate manufacturers as the shea nut by-products are among the principal ingredients in cocoa butter equivalents (CBEs). Major destinations for Nigeria's Sheanut are the EU and Japan. 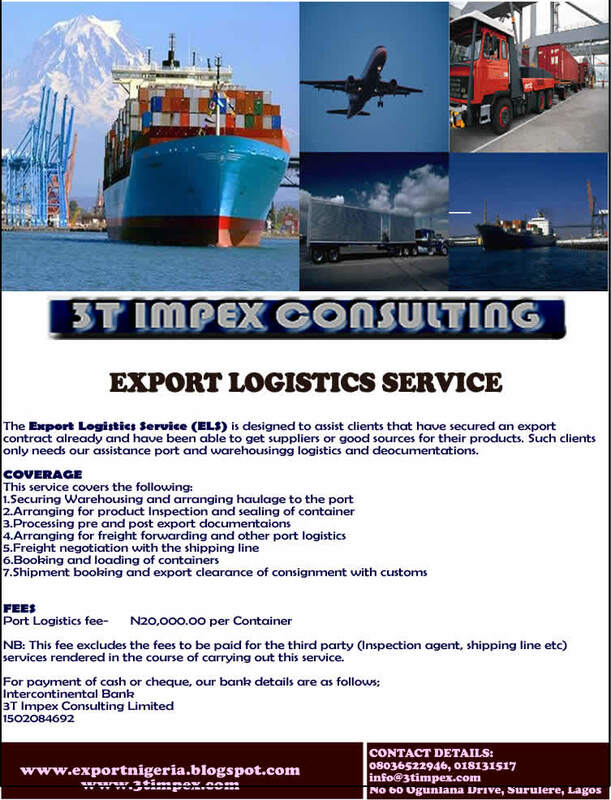 Major European importing companies are primarily based in Denmark, Sweden and the UK. 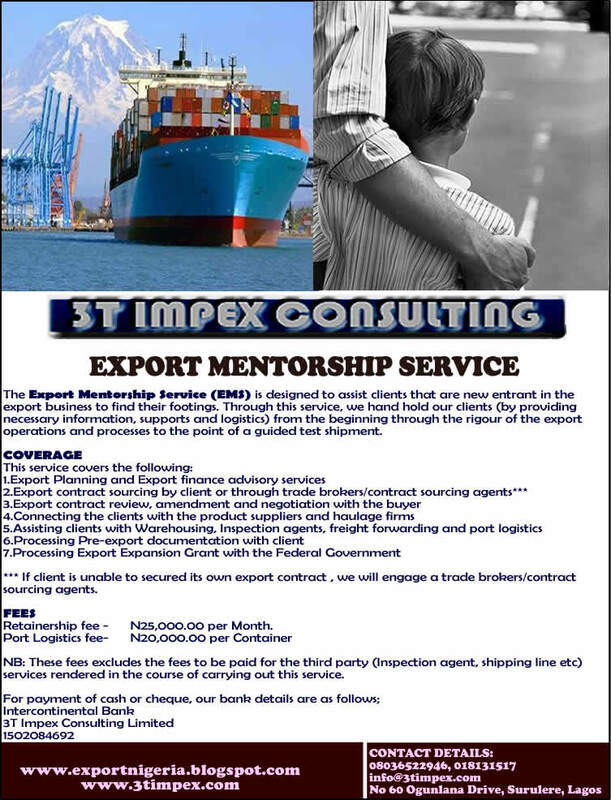 Export Price: The export market price on FOB terms ranges from USD350-650/MT and sometimes or even more depending on the period during its season. 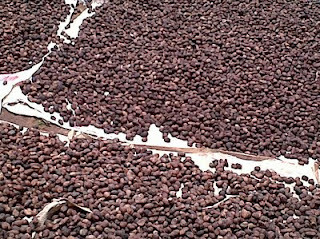 Local price: The local market price of shea nuts per MT ranges from NGN40,000 to NGN80,00.00 or even more to deliver it to Lagos during the season.